To most, the feet are just an appendage to put in a shoe. Problems with the feet can progress to the knees, the hips and further up the axial spine, all the way to the head. The human foot is a strong and complex mechanical structure containing 26 bones, 33 joints (20 of which are actively articulated), and more than a hundred muscles, tendons and ligaments. It does have it's limits though. The plantar ligament is under tension while standing upright and during locomotion. Eventually, the ligament will stretch, either from age, repeated stress or additional long term weight gain. When the ligament begins to stretch, the cuneiform bones are not held in position and can shift. Each foot has 3 physical arches. Together they are called the Plantar Vault. The slight mobility of these arches when weight is applied to and removed from the foot makes walking and running more economical for the body in terms of energy expenditure. 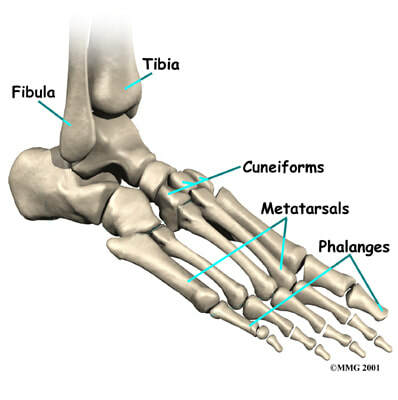 Stretching of the ligament along with the shifting of cuneiform bones will cause foot and ankle pain. In time, due to the body trying to adapt to these changes, pain may be felt in the knees, hips, low back and eventually further up the spine. Foot issues can even be the cause of headaches.